Struggling to keep your class engaged or have a few behavioural issues? Stephen Johnson has 3 key ‘tools’ to take ownership of your class. It’s easy to say teachers should give students more ownership of their learning. It’s easy to say students have to be motivated to learn. It’s easy to say teachers need to give up more control of the teaching and facilitate more of the learning. It’s easy to say but they are definitely NOT easy to do. When students are drivers of the learning and not just passive recipients, it turns a dormant classroom into a thriving incubator of innovation. Many educators want to do all of these things but are too often left to figure out how to do it. Student agency is an important element in a competency-based classroom. Yet teachers and administrators become hesitant at the thought of students being in control of their learning for several reasons. One, they do not want to release the control that has traditionally defined the role of the teacher. Two, they do not feel that students know enough to make the appropriate decisions if they are given choices. It’s hard to imagine changing practice if you firmly believe that the only way to manage classrooms of immature students is through control. However, the science of learning provides another path. When students are motivated, engaged, and coached in the skills they need to take ownership, they develop the mindsets and behaviours to self-regulate their own behaviour. Student agency means that students develop an understanding of themselves as learners, knowing how they are progressing in the class, and setting realistic goals to meet. Students develop one aspect of their voice by communicating their wants and needs. It is developed along a continuum, beginning with some very simple opportunities that lead to other more complex situations that allow students to be agents of their learning. A shared vision created with the students increases buy-in. 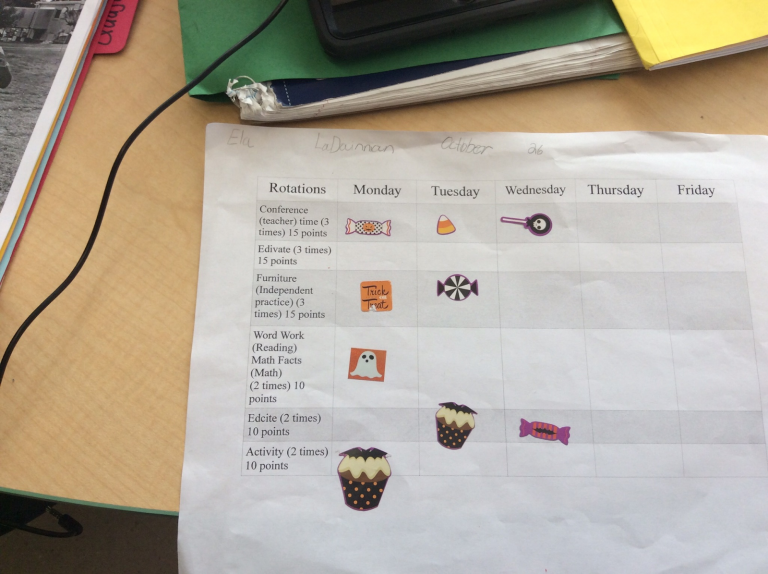 A set of target trackers will hold students accountable on a daily basis. A parking lot is a place for students to share their thoughts and ideas before, during, and after instruction. A shared vision created with the students increases buy-in.The shared vision is a set of expectations of what the class will become. 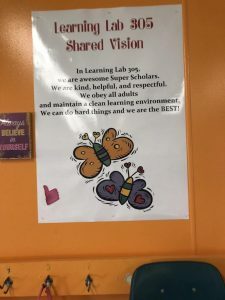 Whereas classroom rules are established by the teacher for compliance purposes, a shared vision is created through a collaborative effort between the teacher AND the students. Students describe what the class should look like, feel like, and sound like, taking cues from the school or district vision. It is a declaration of what the classroom and the students in it will become. It can either be recited daily or referred to throughout the day to keep all parties focused. It may be part of the morning ritual, along with school mottos, the pledge of allegiance, and other school-related ceremonies. This can look quite different in middle and high schools. Secondary students have clear thoughts of what their learning space should be like. They need the opportunity to craft a vision of they will become within that classroom. It must become part of the everyday fabric of the classroom. One of the biggest benefits of a shared vision is that it uses student agency and voice. This serves as a prime opportunity for teenagers to be heard. They chose what words, phrases, and ideas are part of the vision that describes who they are. Another benefit of implementing a shared vision is that it helps set the tone for the classroom. If adopted, the culture of the classroom, and eventually the school, will shift to maximise all of the characteristics proclaimed in this vision. The expectations are now in print and visible. The ideas are now more concrete rather than just something that the class should have remembered. A third benefit is that it provides valuable information and insight for the teacher about the students they are teaching. During the process, students’ thoughts of success and failure begin to emerge. They express their frustrations about previous learning environments and they begin to believe in the idea that the classroom is a place for them. 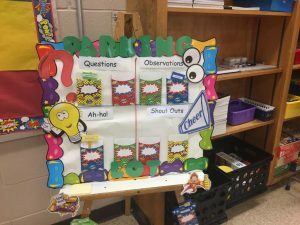 A set of target trackers will hold students accountable on a daily basis. Students tracking their own progress may look different at various grade levels but the overall importance remains the same. 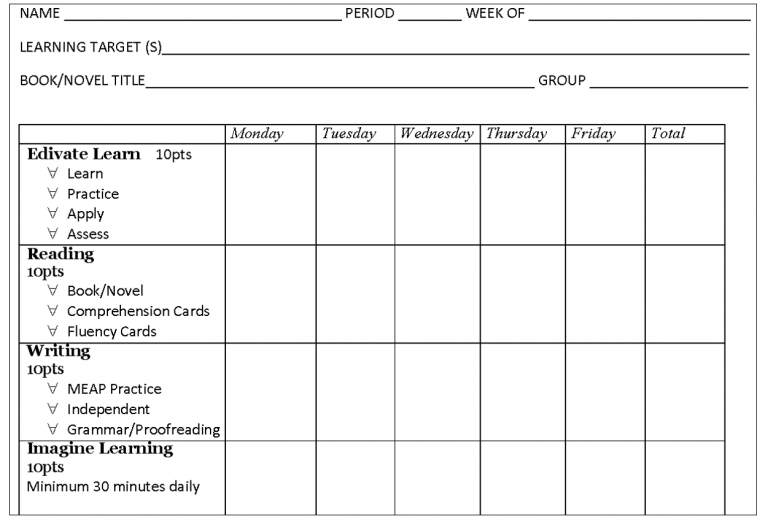 A personal target tracker is an accountability tool for students to use as they matriculate through the classroom on their own. It is particularly helpful when implementing a station rotation model, where students move from station to station at their own pace, independent of time. (By pace, I mean that students work in the station until the assigned task is completed, not after a set time limit. Those who need more time are allowed to finish while those who finished quicker can move on to the next station.) The tracker shows what stations and assignments have been completed on a daily basis. It functions like a playlist. 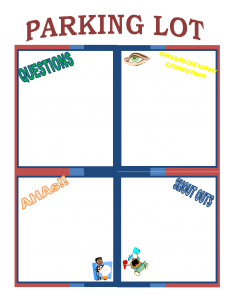 Whereas a playlist may provide all of the specific options for students to work on, the target tracker allows the student to choose their stations and assignments and to document what they’ve completed. Please note that as a playlist often implies heavy technology-influenced instructional practices, tech tools are only one option for students to work through in a station rotation. Out of five stations, tech should be an option in two stations at the most. For example, there may be a reading station, a writing station, a technology station for all tech needs, a project/hands-on activity station with art supplies and manipulatives, and an independent work station. The tech station would be for students to use the approved software programs such as Dreambox Math, Lexia, or some other self-driving program. Although reading online or typing an assignment are necessary and can require a device, these activities do not need to be part of the technology station. The tracker becomes a talking point during conferencing at the teacher table. (You do have a teacher table included in your station rotation, right?) It serves as a daily checklist of what has been completed prior to the conference. It can be a pencil/paper document or a playlist in a Google Doc. It tells the teacher what the student has been doing while the teacher is facilitating and working with a small group. It highlights the areas that have been worked on and areas that have been neglected. By allowing the students the opportunity to “work the room,” they learn how to work on tasks, how to be responsible for their own work, and how to discipline themselves in being independent learners. The classroom control we learned in our colleges of education no longer works as well now. These are not empty vessels waiting for learning to pour into their heads but are children full of experiences and ideas ready for exploration and excited to learn about the world. The categories may vary based on the age group or the classroom in which the parking lot is used but the spirit is the same. There are teachers who use a physical parking lot on the wall, like a poster or chart paper. I’ve seen whiteboards where students can write their thoughts or use Post-it notes. 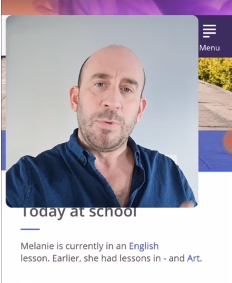 Others have found online resources that work just as well, like using Padlet, and had it projected onto a wall or whiteboard. The form in which you decide to use it is not as important as the idea of YOU acknowledging and responding. Be aware that if your focus is on your computer screen too much, you may miss some of the other activities within the classroom that need monitoring. I use parking lots regularly: for professional developments, in the classroom, and other engaging trainings and presentations. I preferred the poster version because it can be hard to ignore. It’s in a place that requires me to look at it and address it. I can check it as I am talking and address the questions within the flow of the presentation. The poster allows me as the facilitator/teacher to leave student/participant comments visible until the proper time to address them without losing too much of my focus on the audience. There has to be a time before they leave your presence to address their thoughts. This simple act will increase the value of the tool exponentially. Remember the two reasons mentioned earlier about why some teachers are maybe hesitant to give students control of their learning? Leadership expert John Maxwell once said that the more control you give away, the more control you gain. Releasing some control helps to build teacher/student relationships, trust, and patience. Teachers begin to see how the students think based on the questions and comments they share. Students will see that their thoughts and words are respected because they are being acknowledged. Students also begin to learn patience because they’ll have to wait until you address them, as opposed to the traditional student standing next to you calling your name repeatedly until you respond! As you surf the internet, you will see examples of parking lots that have different sections and quadrants. Choose or create what works for the children you serve and work it to the max. It doesn’t matter if you serve kindergarteners or seniors ready to graduate. It doesn’t matter whether you teach one subject or are departmentalised. There needs to be a system in place to facilitate and encourage students to speak. Ownership of learning comes when students understand expectations and recognise why the learning needs to happen. Teachers have to spend time in the beginning, deliberately directing students to use the tools and being consistent with the usage. The impact of these tools is not whether they are electronic or not. It’s not if you have a generic form or a themed tool. It’s not if they have three or four quadrants. It is whether or not you give them any attention. If you acknowledge those tools and address them, if the questions on a sticky note are not answered, the tools will be pointless and not used. 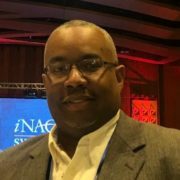 Stephen Johnson is the former Data Analyst and Student-Centered Learning Coach for the McComb School District in McComb, Mississippi where he led the district-wide implementation of a competency-based, personalized learning model. He helped teachers use data to improve daily instruction and integrate technology into the classroom. Stephen recently joined the Highlander Institute of Rhode Island as an Educational Strategies Specialist. He resides in Detroit, Michigan with his wife and one daughter.